Want to maximize your home space? Many of the row houses available in the market now have limited spaces for extra appliances and storage so they need to plan every detail of their appliances and various accessories to maximize what little space they have. It's not actually hard if you will see other creative ideas on using up all possible storage without sacrificing the space in your house. This one uses the dresser's two sides to function as bookshelf which add usage and creates a different approach to home decors as well. The key to make it beautiful is to maintain order so it will not look messy. 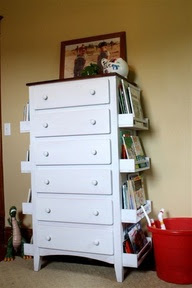 This way the kids can get their books easily without messing up the dresser. Such creative and very useful ideas fit for families with small bedrooms and no extra space for storing plenty of books and magazines. Great help!